It is the time when people want leaders they can trust. This means leaders who are genuine, human, open, vulnerable and visionary. This all sounds great right? Of course it does! Who wouldn’t follow someone who they could trust and inspired them to a great vision? I know that is what I would love to see in leaders. So what is the problem with authentic leadership? That they are hard to come by in the world and not because leaders don’t want to be authentic, but I don’t think they necessarily know how. I will generalise for the sake of this blog post, but fortunately enough I have also come by the great authentic leaders in my life time so I know they exist. But why is it so many leaders find becoming authentic leaders difficult? They come from a generation that was taught that knowledge is power. Their entire career they have functioned in this way making it to the top because their USP was their knowledge, whether specialised in a field or a certain company. This may mean they are not so great at delegating or trusting others with information. They were told to leave their personal baggage at home. I know this as I remember still being taught this at university. However, this no longer applies. Mainly because research has shown how this is impossible to do. What happens at home affects work and what happens at work affects home, there are no clear boundaries when it comes to stress, emotions, and therefore performance. Nevertheless, as they learnt that this was the case they have spent time creating a “safe façade” for times of stress to look as they have it all under control. Leaders for many generations have been told that they are fully responsible for their organisation. Can you imagine this kind of weight over your shoulders? No wonder they keep their distance, act authoritarian as if the organisation is their property, and try to pretend to be calm when something is going wrong and hide information may damage them. From a gender perspective, female leaders were told that the only way to be a leader was to go to battle with “the top white men” to fight for those positions in power, imitating their way of being instead of embracing their self. Power = leadership idea. They were taught that you had power if you were at the top and you had to command respect. This is very different that saying, you must earn the respect of others and this will make it easier for people to believe in you and work with you to reach mutual goals. The problem is things have drastically changed in the business world, not only because the newer generations want and know that work is an extension of the self and therefore want to work somewhere they believe in (they are more focused on purpose rather than money), but also because of media and a sense that we, as Maslow well puts it, as humans desire to fulfil other needs (esteem, self actualisation). The advances in technology and media help us uncover the truth and people will always be searching for the truth, so it is time to create a new paradigm within organisations, a new culture, a new way of working that will enable us to have the authentic leaders we are all hungry for. Oh I really love hearing Nitta Clarke and David Macleod speak. Towards the end of last year I had the fortune of hearing them both at a Hay Group Engagement Forum and at the Engage for Success Open Evening. Why do I value their speeches so much? To be honest, they say a lot of things I think, but 1) are brave enough to say it out loud to anyone no matter who they are and 2) have years beyond my experience so I always like to know I am not completely insane or alone in my battle to make engagement a strategic topic. The title of this blog entry was inspired by something Nita said, and something I have been talking about for years. No matter what you change, what you re-engineer, or if you have fabulous systems and processes in place, it is the people that make the difference. I think a lot of organisations are starting to see it. I am not convinced many know what to do with this information as it provides a real eye opening statement. A lot of us converted ones who have always believed this find it common sense, but actually in practice and in my interactions with clients; it seems it is world apart of what business world used to focus on. It’s not only a millennials vs baby boomers problem either. Every day people are looking at work differently than they used to, as an extension of self rather than something to pay the bills. People recognise the “job for life” has long died and now want a two-way relationship with their employer. Even more challenging, people are expecting managers to be leaders and inspire rather than just hand out work or instructions. Managers and leaders at all levels are now expected to gain the employees trust and respect rather than these existing by default because of their titles. So a lot of change in the workplace, and as many OD professionals know when we talk about such a dramatic change in culture, mindset, and behaviours it is not an overnight thing. Just another phrase from Nitta “engagement is not putting lipstick on a pig” it is about embedding it within the culture of the organisation. So from an OD perspective if you are new to this what can you do? Find out where you are, whether it is an employee survey, random interviews, focus groups, or a mix of all of these. Try to understand how you currently do in regards to the four enablers. Does your organisation have a strategic narrative and vision? If it doesn’t help them find it! Why not even give Appreciative Inquiry a try using their stage of Dreaming the future? Once you know where you are and where you want to get to work with a mix of staff to get there. Both top/down and grass roots approaches work have a huge impact. Focus on grass roots if you don’t have leadership buy-in and build case studies in their language to highlight the successes. 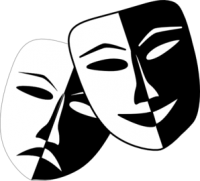 What do Acting and OD have in common? That’s different, how do you make it work? I used to struggle with both actually as having two careers in my head and heart they were exactly that: two separate careers. I don’t know if it is due to talking to more OD professionals that like the arts or my mentor who knows more actors that have their own businesses, or maybe it is just because I have been lucky enough to go back to training on my acting craft that I now see tons and tons of similarities between OD and acting. I sit on the bus after a long day at work followed by acting class thinking about how it all makes sense somehow. Acting is about telling the story and understanding the character’s journey– well in OD a very important part of the process is to understand where an organisation has come from and where it is heading, much like a character in a script. The story goes beyond the lines written – in OD we have to base our diagnosis not only on policies, written procedures, or what the leaders say, but we have to dig deeper and find the reality of the organisation much like as an actor when I prepare I have to understand what is written between the lines, what my character is really saying, what the intention is behind the lines. “You can’t act what you don’t know” I have quoted this as it is a frequent saying from my acting coach talking about if you don’t know where your character really is at that moment in time, what they are really thinking, saying, feeling, then the acting would be “acting”. – In OD some consultants “act” they pick a symptom to work on, then do not have the effect they wanted, and the client is stuck with a new problem. Others prepare their part, diagnose, plan, act, review, plan, and act helping the client develop. You need an objective for yourself as a character in a film or play, this will determine how you approach each line – in OD you need to have a desired future, where you are going to, the vision, so you can then plan a way to get there. In OD self-awareness is key – this could not be more true in acting. As an actor I have to be aware of my own biases, knowledge, and experience and be able to draw from it, but I also need to know and observe people to gain their experiences. In OD you do the same by knowing other experts. In regards to the process, well I’ve already touched upon how OD and acting use a similar diagnosing process. You can say that planning is the rehearsal part of acting, and then implementing would be reading the lines in a theatre show or film. You then review the footage, see what worked, what didn’t and if you need to you re-shoot. If in theatre you review where that got you to, and decide whether you want to tweak anything before the next night. So as you can see the similarities are all there. I’m glad I’ve realised that both of my passions have these similarities as it will allow me to use the skills I have gained to improve both my craft as an OD practitioner, as well as, an actress. So last month I attended an Employee Engagement Conference. Glad to say it wasn’t my first one in the year, but it got me thinking about Engagement & OD and the sisterhood that exists between both disciplines. They will more clearly see the path and rationale of what you want to do or looking at. They will have more insights that you may need to know before taking action. They will have ideas on how to change and what will work within their culture. They will know any road blocks, barriers, and key players and influencers which will help facilitate the change. Getting people on board who may be resistant to change from the beginning will help you and the organisation understand them and think of ways to engage them in the process to make sure they become partners in the mission. This can have a great impact on employee engagement when done well throughout the organisation. When engagement is part of the culture these things will happen automatically and I believe sustainable organisational success depends on these two disciplines being core to that culture. 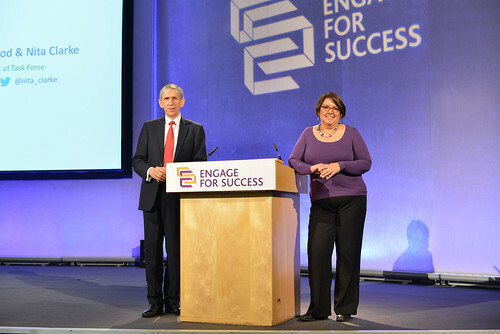 To look at the relationship closer I am going to call upon the 4 enablers of engagement as described within the Engage for Success Movement I am very proud of being part of. Strategic Narrative – Leaders set out a clear vision and purpose for the organisation. During change this is of upmost important, people need to understand where they are going and more importantly why they should change. Leaders must help each individual understand their role within the bigger picture, how they can contribute and the value they add to it. Engaging Managers – Managers that inspire, facilitate, enable rather than control will translate this vision to their employees in their everyday work. The most important relationship an employee has at work is with their manager, so they are vital to the success of any change. They will be the key communicators during the process, they will also be able to talk to senior leaders and be the voice for their employees when needed. They are the ham in the sandwich, in the middle, but an ever so important ingredient! Employee Voice – reflecting what we have said about engagement enabling a great OD process. Looking for this voice will enable innovation, ideas, better implementation and a constant feedback on how things are going during the change process. If people are not convinced and believe the change is for the overall best for the organisation they will not change, no matter what else is done, and without people the organisation will not be successful. Integrity – a great topic of today and very important during change. This is what creates trust in an organisation. If leaders walk the talk, if they are authentic and human, people will follow and be there even when the going gets tough. If the gap between say and do is big, trust breaks and success will seem far far away. Creating a culture is part of the work OD does and creating a culture where employee engagement is embedded is vital now more than ever in creating success in organisations. As many culture changes it cannot be done overnight, but the overall results… well as David McLeod and Nita Clarke mentioned in their evidence paper it is £26 billion pounds on the table! I was recently invited to publish on LinkedIn. As this happened I wondered whether or not to keep this blog. I think several posts may be duplicated, but after thinking long and hard I wish to keep both. The rational behind this, is that the blog can provide a different aspect of my perceptions, while LinkedIn can help discussion or promote the field in a different way. Therefore, this blog will continue. Keep an eye out for the July one! How many of you have ever looked for a role in OD and have looked at the job description blankly? How many of you have been in a conversation where someone describes themselves as OD and when they get talking about what they are doing you think… hmmm really? How many of you have seen training roles, design roles or talent management roles disguised under the OD banner? I am thinking this is an everyday occurrence for many OD practitioners out there. Misconceptions of OD are everywhere. This to me has always been interesting since I was studying my Masters: why was there such a gap between what theory says and what practice does? and why were OD roles so different or not even really OD? It was so interesting that after my dissertation which focused partly on this, I also published a paper about perceptions of OD in Western Europe. However, years later this is still an issue. As my first blog post described what I believe is the core to OD I will not go into what OD really is in this post. I merely offer my perception of why it is that these misconceptions have come to play in the world of practice. I would be interested in reading other practitioners opinions on this so feel free to add your perceptions. Yes, many times OD interventions can lead to learning & development interventions; however, OD is not a synonym of L&D. In practice this is many times forgotten limiting the scope of the OD practitioner and not really giving its true value. OD does not mean Organisational design. Again as with L&D it may be a result of a diagnosis, but moving around boxes definitely is not the only approach a true ODist would take. There is a variety of definitions of OD. Although, they have core values at heart and explain the background behavioural sciences it is based on, not having one overarching definition causes confusion to the untrained eye. OD as a discipline was born due to other behavioural sciences that all influence our practice. Not necessarily fitting into one box has caused OD a lot of issues! This is especially true when we are talking about internal consultants, they do not necessarily fit in one place in the organisation and this amounts to confusion: where should it go? who should it report to? The holistic and systems approach of OD also influences into not fitting in a box. Hence, when not structured at a strategic level can cause many issues of not having influence over certain sub-systems, or not being able to make decisions or reach key stakeholders. OD can work with people strategy changes, strategic changes, start-ups, leadership behaviours, reward strategies, IT changes, overall business transformations, structural changes, relocations, process changes, creating employee engagement and cultural changes. This wide remit of changes causes havoc in practice and reflects point 2 and 3 above. Last and not least, there is no one size that fits all when it comes to OD. Both national culture and organisational culture come into play. This means skills required by practitioners will not only depend on the type of project, but also in what context they are working in. How to prevent all these misconceptions and roots of misconceptions? Interesting… and not such an easy question to answer. I think it is partly down to us as OD practitioners to keep making people aware of what we do have to offer an organisation wherever we are structured and no matter at what level. Although, I also do not think this is solely the accountability of the practitioner or OD academic, I do think we can go some way into creating awareness of what we mean by OD. In my last post I talked about the worrisome plague of short termism, especially in times when organisations are undergoing crisis. Unfortunately, this tendency to focus on “now” doesn’t only affect those undergoing massive change or challenges, but also in day to day operations. Sometimes clients are so busy with their day to day duties they do not have the luxury to step back and look at the wider picture. As practitioners it is our job to help our clients step back, enjoy the view, and remind them of WHY they are doing what they are doing: letting them remember their purpose and their vision of the future. This sounds much more easier than done, so here are some tips I have used successfully in the past or I have seen colleagues use successfully in the past. Under crisis first think of what costs are really essential. Do you really need to see X person face to face, or can you arrange a video conferencing call/ teleconference? If you really need to travel buy economy class tickets. Do you really need to print out all those documents? Can you use a PDF version and read it online? You might laugh, but it is incredible how much goes into buying paper, cartridges and general office supplies. If cutting costs using the method above does still require more analysis, think about the overall operations of the organisation. What is essential and what can go? This is a tough decision! In order to help your client really understand the essentials, ask them to consider what they need now to take them past the dip, and what will they need once they recover? What they list in both lists will be the essentials now, or highlight where investment needs to go. It is a known fact that many organisation cut down on training, as an example, during periods of downturn, soon to realise that they actually needed to take time during the dip to up-skill staff for their new roles… so was it really a nice to have?? Once we get out of this, who and what will we need not only to survive, but to accelerate growth? Why? Ask your client why they have taken a certain decision. Go one step further and ask why again. This will help them get down to their “real rationale” or see if this is really the way to go? How will this contribute to our 5 year plan? How do you see this working? Ok, this may help us now, but will we need to review it again later? How will the future look like, feel like… will this help with that? Will this really give us a different result? Have you asked the people involved what they think? Did they have any ideas that are worth exploring? Draw me a picture of what the future looks like? Is there a place for X or Y in our journey there? Can we do something different? Using art, pictures, or story boards can be a powerful tool to get your client thinking creatively about the future. What’s more important getting there or how? Now this one is almost a trick question! The value is that you really see the underlining assumption of your client and the way they work. If they are totally results driven you can start thinking about them sustaining their result and if the action they are thinking on taking will only have these in the short term or will they be sustainable and go from there. Is this were you thought we would be now? What could have we done differently? What did we learn? What went well? Who should be involved next time? Did we give it enough time? What will the legacy be? Not just for now, but for your children? Now this is quite a hard one, as one the outside looks like a question for environmental causes, but what we forget is that organisation no matter in what sector play a role in society as a whole, so any action they do will have a ripple and compounding effect on their community’s future. As a discussion point if you are a practitioner and have any other questions or tips on how to get your clients thinking on the long term please comment on this post as it will be a great resource for us all. One of my biggest concerns since I started my career was the lack of capability or awareness that organisations have in focusing on the long term. Perhaps, because I come from a developing country, but I have seen how organisations behave in crisis time after time and it never stops to amaze me. As I am passionate about the subject and I know how hard it is in practice, the next two if not three entries will be related. Many people talk about our current economic crisis and how organisations are looking at surviving these periods. I am not saying that looking at how to survive is not important… but it isn’t the whole picture. Organisations can develop “short termism” during these challenging periods, their tunnel vision focus becomes on results and “results now!”. This can be very damaging in many ways… Of course, if the organisation is in danger of bankruptcy it will be vital to find quick ways to cut costs, improve efficiency and financially sustain oneself. However, if the organisation is merely finding itself in a small dip, focusing on the short term can lead to unforeseen negative consequences. I remember back in university our OD teacher thought us a very valuable lesson which I will now pass on to you. Let’s say you have an organisation, you find yourself in an unexpected crisis. Not sure what to do you do what everyone else seems to be doing… you cut costs and you downsize. 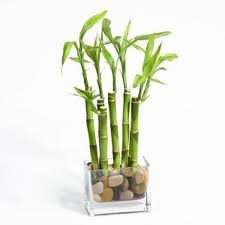 You stop investing in things that seem “unnecessary”: you cut down on training costs, meeting and travel costs get cut, you outsource your IT, you outsource your recruitment, and you decide that your staff bill is too high creating restructures and voluntary severance packages to get rid of the “excess”. In the short term you see your financial statement the following months and you are impressed, the numbers says what you want it to, you have had a positive result (I’ll call this the result blindfold). You fail to view the whole picture, until one day you find the numbers start plummeting again. You start asking yourself, why? You have two choices here: 1) do the whole cycle all over again or 2) take off the blindfold. – And maybe even you will realise that all that expertise you outsourced is costing you more than you initially planned My teacher’s point was that when you find yourself in a dip, before you make any decision ask yourself “what will I need once we get going again?”. I truly believe that this question will help people look at the different options there are to start climbing back up the curve in a sustainable fashion. In my opinion there is a reason why OD works with an Action Research approach. There is also a reason why Appreciative Inquiry professionals use the word “Dream” to describe an organisation’s vision. When thinking about change, it is important to have your ultimate goal and the steps to get there (these are your shorter term goals). Each time you make a change, go back and check, observe the results, give them the appropriate time and think about your next step for that ultimate goal. So for example if the change is a process it may only need a month to show results, however, if it is a cultural change, no magic wands have yet been invented so give it time to show results (6+ months is recommendable). In conclusion: Research your organisation, Plan change, Action change, and Research again. It is a cycle, a continuous one, and that Dream or long term goal can always change and evolve, just make sure to keep it in mind. TO BE CONTINUED… AS AN OD PRACTITIONER WHAT CAN YOU DO TO HELP YOUR CLIENT FOCUS ON THE FUTURE? Every discipline has a set of guidelines, rules, values they base themselves on. Think of Medical doctors and their Hippocratic Oath… each discipline has one. ODists although not ever forced to say an Oath live and practice through a set of values which greatly influence the way they approach their work. These are OD’s Golden Rules. These go back to the 50’s and 60’s when OD emerged and the likes of Beckhard, Bennis and Tannenbaum started reflecting on what it meant to be an OD practitioner. A set of these are nicely summarised in French and Bell’s book on OD (reference at the end), but I would like to highlight some of these core values and how they have influenced my practice and my belief system on OD. These golden rules influence every intervention (including diagnosis) I work on. As part of the exploration process I try to include as many people in the organisation as possible. I believe people may at first if in a command/control culture may not feel comfortable talking to me, however, I take my time to build rapport and trust to gain the best insight. The more people I talk to, the less research bias. In regards to my consulting approach, I strongly believe in process consultation and collaborating with the client to find a solution, letting them develop their skills and helping them take risks into the unknown or new ways of doing things. I also take it as my responsibility as a consultant to facilitate the understanding process of the client. 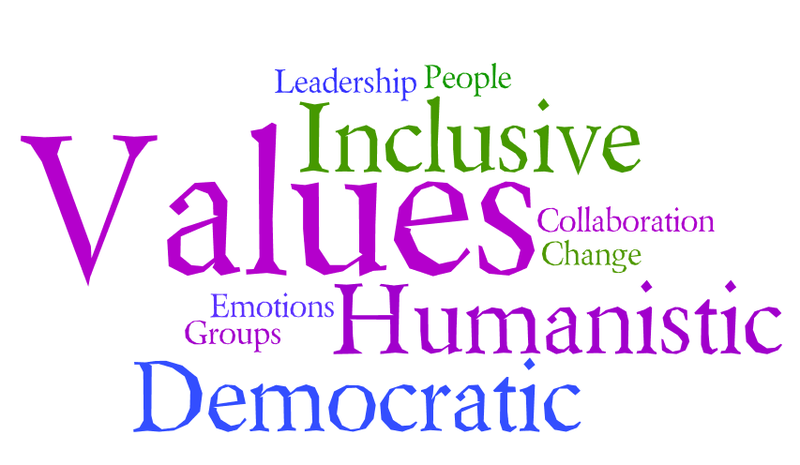 Get them to see how the diversity within their organisation can be embraced and take advantage of having this wide range of views, help them understand employees are human beings and will undergo a range of emotions during the change process, and that like their employees they will too. We are there to support and help them see they do not need to come up with all the answers but just tap into their people who have the knowledge and probably really great ideas!! Another responsibility I have is to put the greater good of my client as my priority. This means taking risks myself and challenging their status quo and beliefs when necessary. This is a challenge for a lot of internal consultants, but it comes in being authentic to these values and ethical practice. Some of these may seem simple, but in practice there will always be times when your values are put to the test. Always remember these, I know I do, as these are the values that made me so passionate about this discipline and my duty to help organisations become a better version of themselves. French and Bell (1995) Organization Development. Behavioral Science Interventions for Organization Improvement. Prentice Hall.